Yesterday the House Intelligence Committee announced at nearly the last minute that Michael Cohen’s private testimony was being postponed for three weeks. Palmer Report pointed to some clues that strongly hinted about why it happened, and now a federal judge has come out and publicly revealed the reason. Palmer Report pointed to two key clues. First, a sealed item in the “USA v. Cohen” case was posted to the court docket at nearly the same time Michael Cohen’s testimony was postponed. That item was later withdrawn, but we took it as a sign that Cohen is still cooperating in ongoing criminal investigations into other key Trump people, and the fruits of those investigations are about to surface, so the House Intel Committee decided it was better off to wait a bit before Cohen testifies so he can discuss them. The second clue was that the key Democrats on the House Intel Committee were all smiles while discussing the postponement, meaning they viewed it as a good thing that was going to work out in their favor. Now the judge in the Cohen case has essentially confirmed all of the above. The judge revealed today that the criminal investigation involving Michael Cohen is still ongoing and is now focused on “other subjects” who remain unnamed. 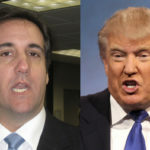 It’s not difficult to parse that Cohen is cooperating against these subjects (almost certainly Trump underlings and/or family members), and that he can’t spill the beans until they’ve been rung up. That means everyone involved expects them to be indicted and arrested within three weeks max, whoever they might be. The big question here is whether tonight’s news about David Pecker’s attempted blackmail of Jeff Bezos is related to this. Pecker originally cut an immunity plea deal against Michael Cohen and Donald Trump. Now Pecker has been caught allegedly violating that detail in extreme fashion. If so, Cohen could be testifying against Pecker as we speak. Or it could be some other target, unrelated to Pecker.